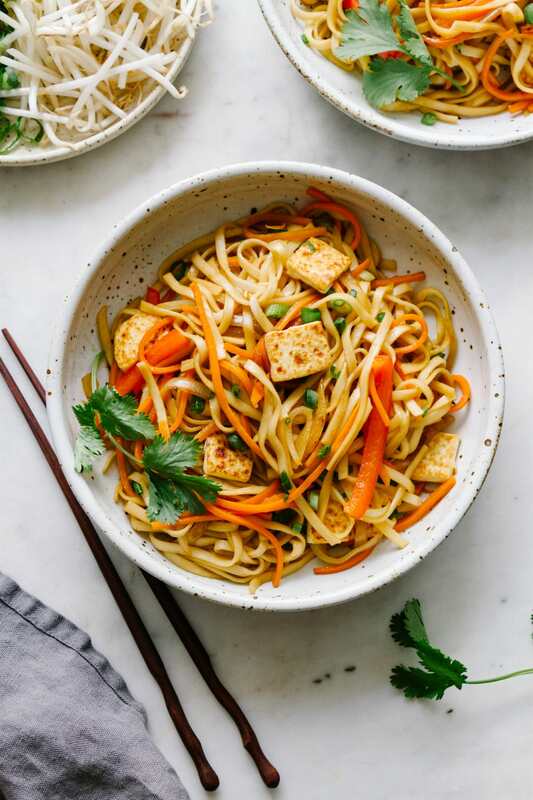 Vegetable Lo Mein with tofu is a super easy weeknight dinner with assorted veggies and ready in 30 minutes! 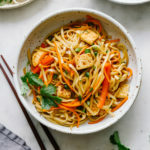 Crisp vegetables, protein rich tofu and noodles all combined in a flavorful vegan sauce the entire family will love it! 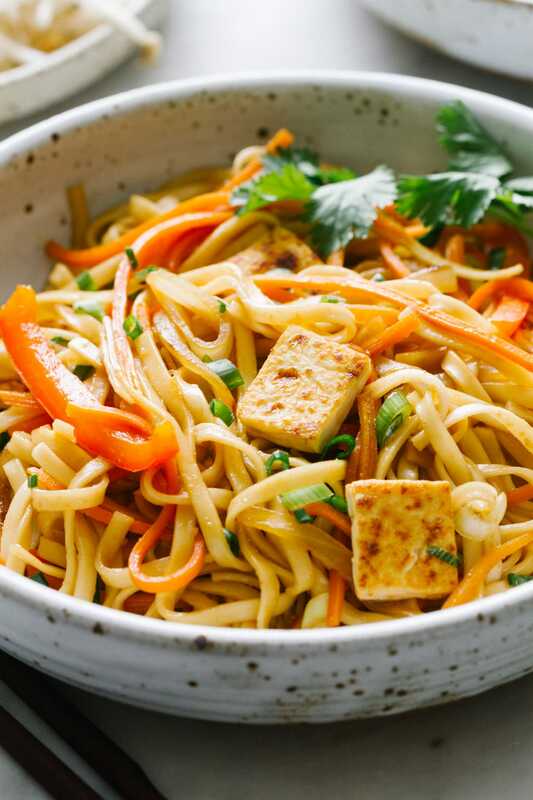 Skip the take out and enjoy this vegan Vegetable Lo Mein with Tofu at home with your family or guests. This recipe is super versatile, easy to throw together and will be on the table in 30 minutes. Life just got a little simpler! 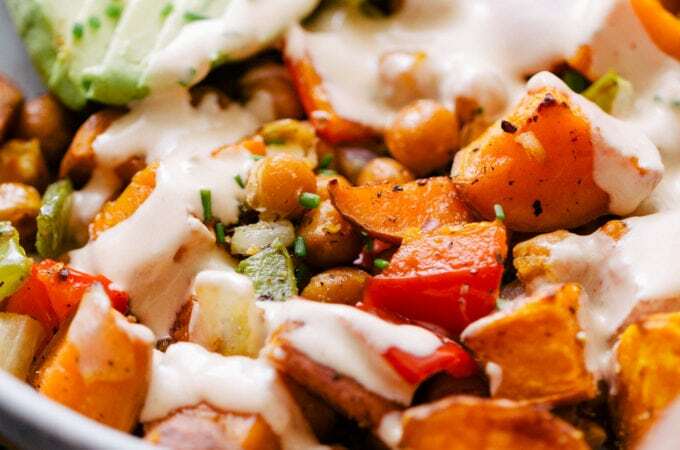 Recipes like this are golden, and I love finding and sharing these quick & easy meals with you. Here’s a couple more quick & easy noodles recipes to try, like this Tempeh Chow Mein, Simple Udon Noodle Bowl, or Garlicky Mushroom + Kale with Linguine. 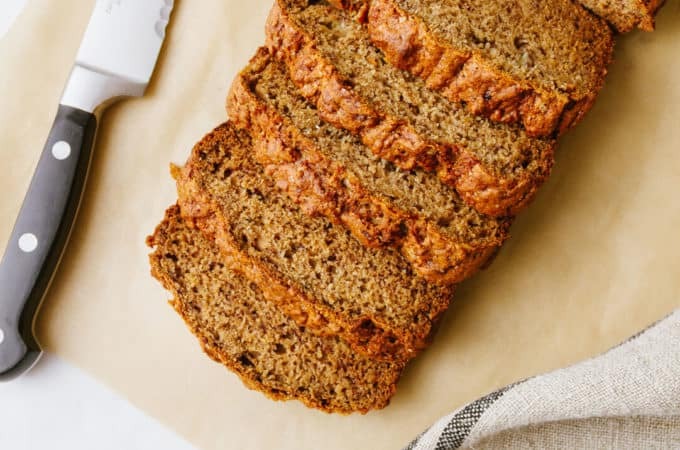 All are healthy, easy and delicious! So back to this Lo Mein! This is a healthy, vegan Lo Mein recipe and we’ll be making our own sauce, no pre-made bottled stir-fry sauce here. I do recommend using mirin (may favorites are Eden & Ohsawa, containing no harsh ingredients) if you have it on hand for an extra umami flavor, but if not pure maple syrup will do fine. Recipe inspired by Cooking Light: Global Kitchen Cookbook (< affiliate link). It’s not a vegan cookbook, but I can pretty much veganize anything when needed and can’t wait to bring more inspiration from this book to you! What Vegetables Can I Use For Vegetable Lo Mein? This is what I really love about Vegetable Lo Mein, you can use lots of different veggies here. 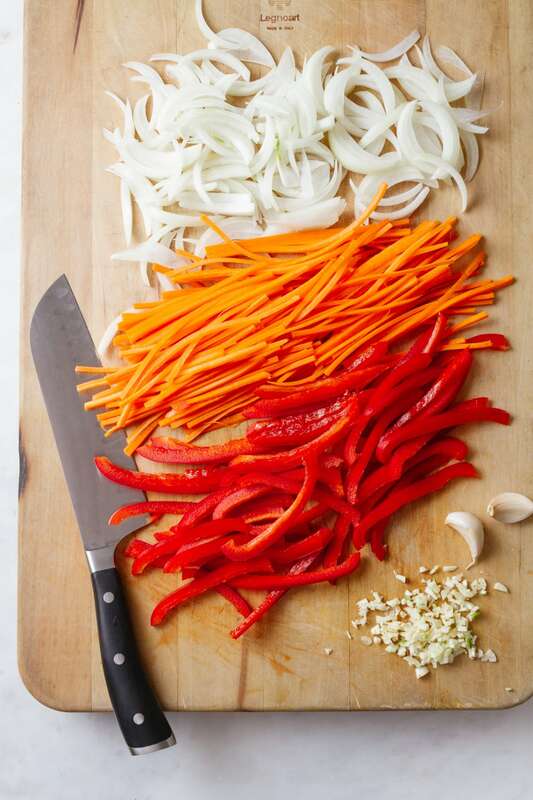 Need to clean out the fridge, you most likely can put whatever needs to be used up into an awesome Lo Mein! A few vegetables to use are – broccoli, carrots, asparagus, cabbage, bok choy, edamame, green beans, scallions, onions, bell peppers (any color), mushrooms, baby corn, snow peas, and sugar snap peas to name a few. What Noodle Types Are Best For Lo Mein? Typically, Lo Mein calls for Chinese egg noodles, but since this a vegan recipe, you’ll want to look for eggless noodles. Really, you can use just about any noodle – eggless Lo Mein, ramen, chow mein, even spaghetti or linguine noodles will work (I used shandong noodles here). To make this gluten free, rice noodles would be perfect. And if you prefer fresh noodles, by all means use those. I say do what suits your tastes and you’ll end up with a totally satisfying vegan lo mein! You sure can! 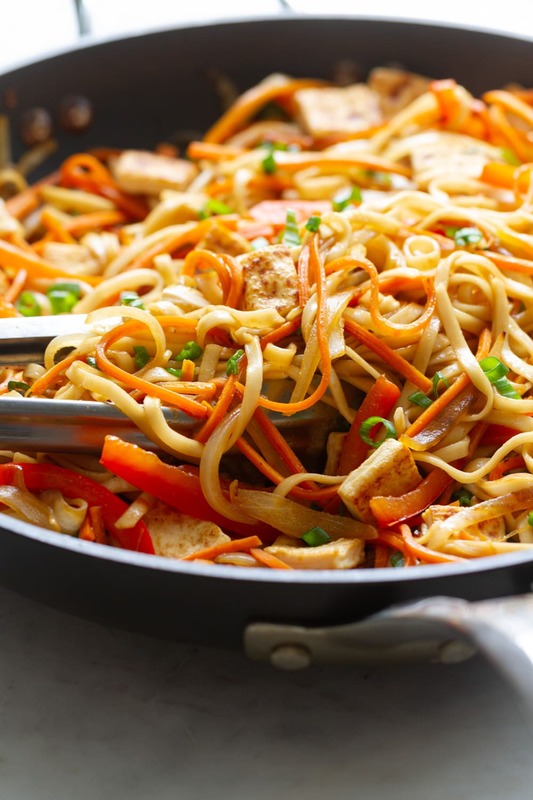 This Vegetable Lo Mein can be prepared ahead of time by simply cooking as instructed, then letting it cool completely and storing in an airtight container for up to 5 – 6 days. You will want to make extra sauce as well, because the noodles may dry out when reheated. Alternately, you can use a little vegetable broth as well. Yes! Vegetable Lo Mein is a terrific recipe for making ahead and can be kept in the freezer for up 3 months. Defrost the Lo Mein in the refrigerator or on the counter top for a couple of hours, then reheat in a wok or skillet, adding extra sauce (or veggie broth) as needed to bring back moisture. For a quick meal, freeze individual portions in freezer bags. 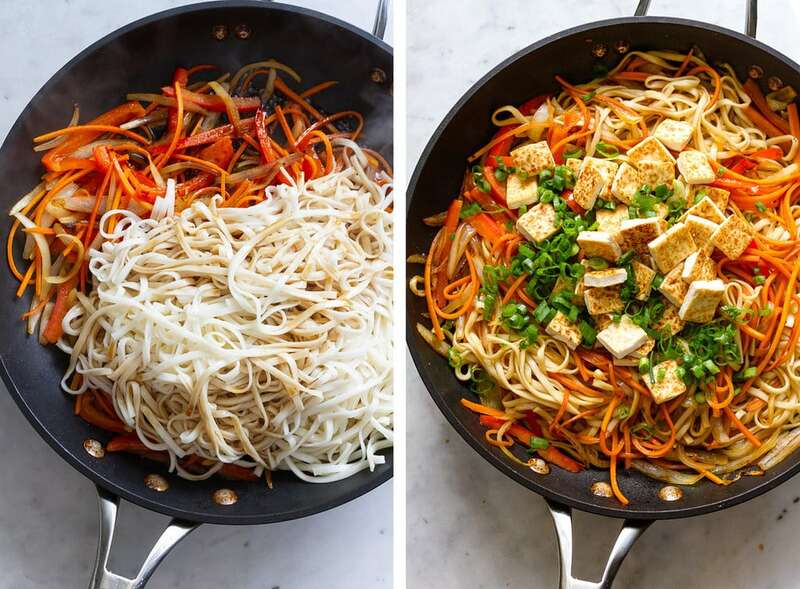 Vegetable Lo Mein with Tofu is super to easy to make and just takes a few steps! 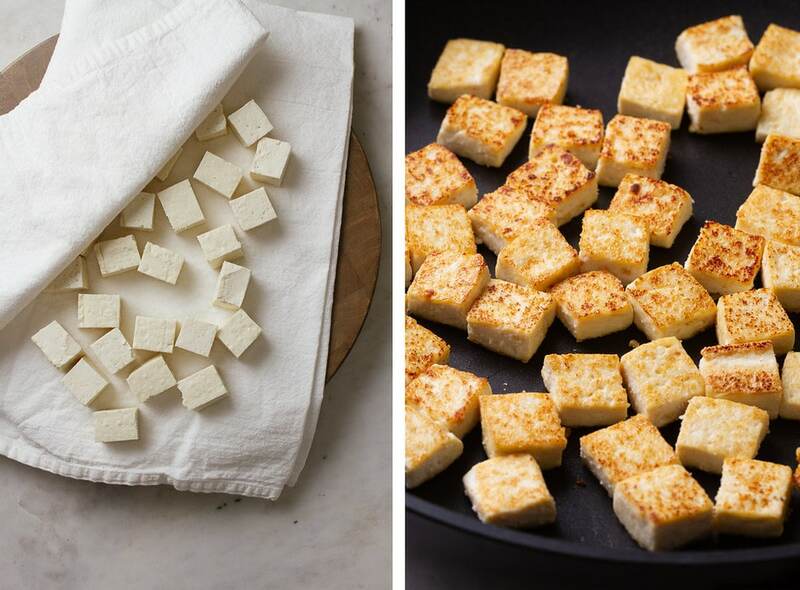 Crispy Tofu: This is what will take the longest and should be started first. Cube the tofu it into 1/2 cubes and patting the cubes dry between a dish cloth or paper towels. The trick is to remove excess moisture (shown above). 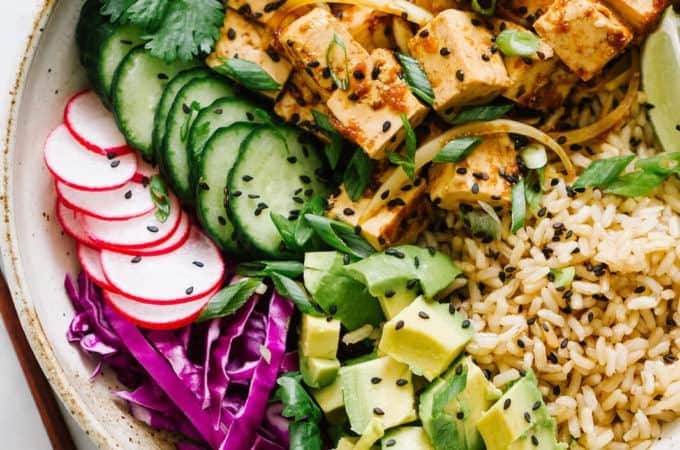 Add a little oil to the skillet and heat it up nice and hot, cook tofu, on each side for about 6 – 7 minutes, shaking the pan often to keep the tofu from sticking, until tofu is golden and lightly crispy looking. Set aside. Noodles: While the tofu is cooking, go ahead and start the noodles, cooking them according to package directions, and set aside. Lo Mein Sauce: In a small bowl whisk together the tamari or coconut amino’s (or soy sauce), pure maple syrup, sesame oil, and rice vinegar, and set aside. If you’re a fan of spicy foods, try adding a pinch or two of red pepper flakes or a squeeze of sriracha to really spice things up. Taste for flavor, adjust as needed. Stir-Fry & Combine: Finally, using the pan you cooked the tofu in, heat oil/broth in a large skillet or wok. Add in the onion, stir fry for 3 minutes, add garlic, carrots, and red bell pepper. Stir-fry until tender, about 4 – 5 minutes. Add the noodles and sauce, toss to combine (shown above). Add the tofu and scallions, mix again. Serve immediately with fresh bean sprouts and cilantro for garnish. And there you have it, veggie Lo Mein made quick, easy and deliciously healthy! Reheat Vegetable Lo Mein on the stovetop over low heat, adding extra sauce or veggie broth to bring back moisture. Heat until warmed through. If you try this easy Vegetable Lo Mein recipe, please let me know! Leave a comment and rate it below. I love to hear what you think, or any changes you make. 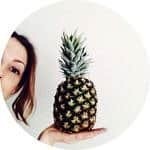 Be sure to sign up for the free Newsletter or RSS where you’ll get the newest recipes, tips, and other tasty updates directly to your inbox.